After an entertaining SmackDown Live last week, WWE headed to Worcester, MA for another action-packed episode of the blue brand show. Considering this week's episode of Raw was a colossal disappointment, we were holding out hope that SmackDown Live wouldn't let us down. As always, the show came through for us. Not only did SmackDown Live blow Raw out of the water, it provided us with an instant classic between Daniel Bryan and Jeff Hardy. If that wasn't enough to whet your appetite, then it's also worth mentioning that The Miz opened the show with a surprise installment of Miz TV, which went down really well with the audience. Of course there were a few poor segments scattered throughout, but nothing too noticeable. Lana's Money In The Bank qualifying match against Billie Kay could've been better, but Aiden English's musicality on the microphone saved the segment from being a total bust. As is always the case, the WWE Universe took to social media to voice their opinions on what they enjoyed and — perhaps more importantly — what they didn't enjoy about this episode of SmackDown Live. 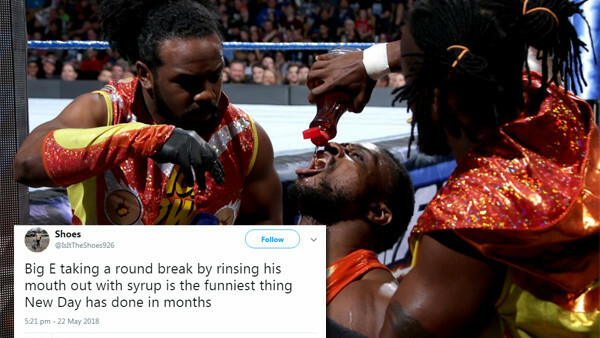 No matter how entertaining SmackDown Live is or isn't, following along with social media users tends to make the whole experience more enjoyable.